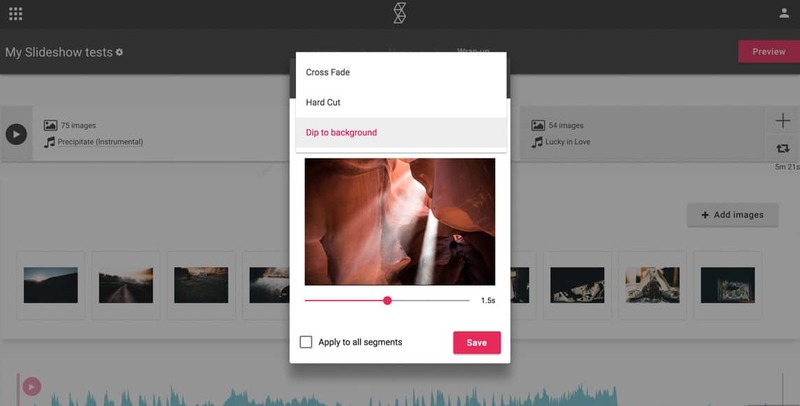 This is a guest review of slideshow software SmartSlides by photographer and educator Mark May. Let me start off by saying that I’ve been making slideshows with photos and music in some capacity for about ten years. 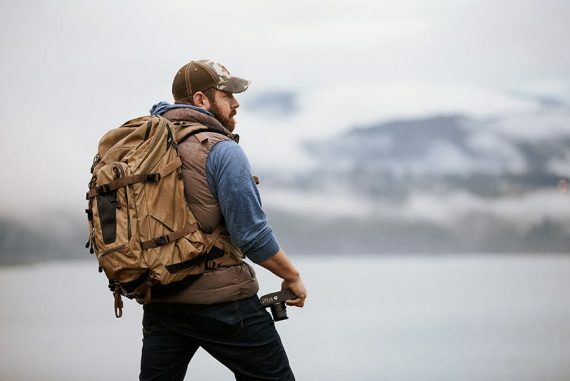 I’ve been frustrated with the products that have been designed for many reasons such as ease of use, ability to professionally present, how much behind-the-scenes preparation time is needed and the basic support of said software. 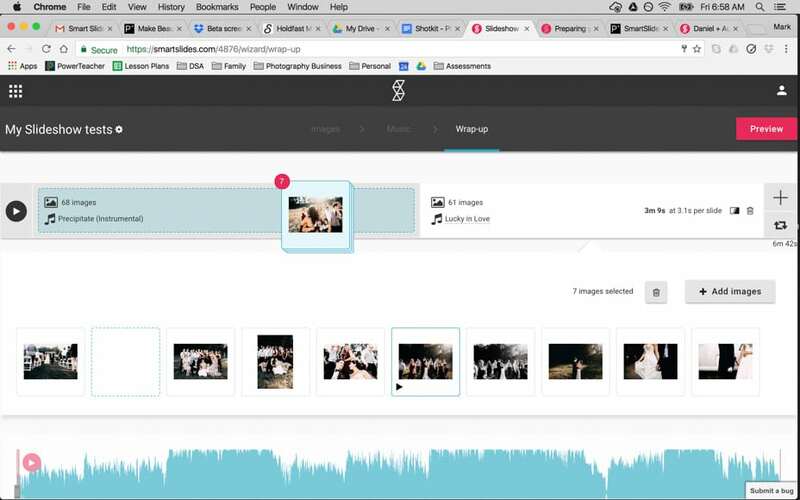 As a wedding photographer, I’m always looking for ways to save time and give my clients a professional product to easily consume their photos on multiple platforms. Pixellu’s SmartSlides does that. 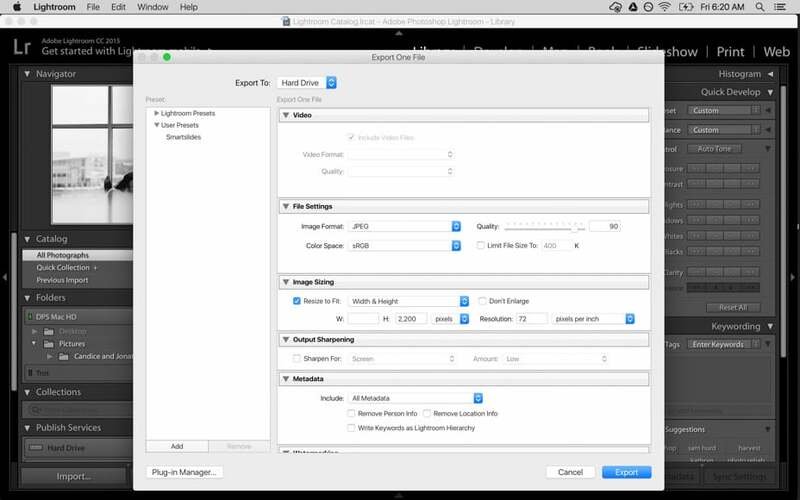 It’s minimized the options to meet all the important necessities, gives the photographer an easy way to make a professional slideshow for clients and doesn’t bog us down with “bells and whistles”. I think many times online photo products forget just how much multitasking we do in our profession and that we’ll take any help we can get. As soon as I opened up Smartslides and was ready to create my first slideshow I was reminded that I had to do some prep work first. 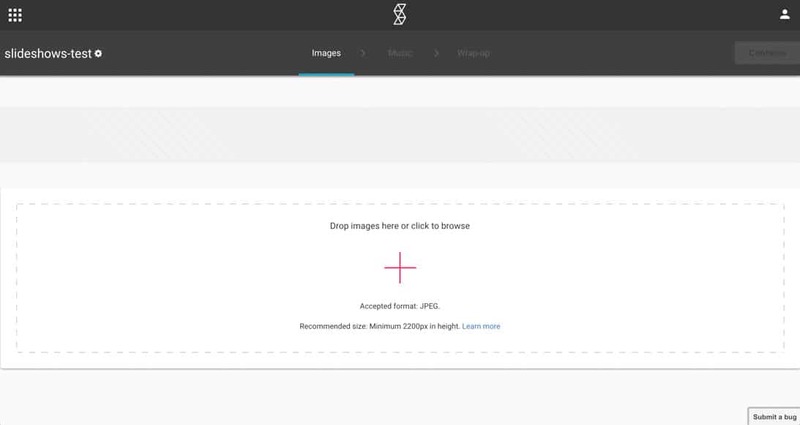 It was recommended to have images that were at least 2200 px high. This seemed like a lot of pixels for a web video so I clicked the “Learn more” button. I was greeted with “minimum requirements”, “recommendations” and a very helpful screenshot of the what the “export window” should look like in Lightroom. I found out that slideshows will display in 4K and that’s why each image needed to be at least 2200 pixels high. That seemed fair. I went ahead and pressed export. I was exporting about 120 images so I had to wait about 3-4 minutes. I added my images by pressing the big red plus sign. This took a few minutes for SmartSlides to process but you could “continue” on to the “music” section as your photos uploaded. I really appreciated that consideration of my time. I was greeted by 7 music “categories” to add to my slideshow with 5 licensed songs per category. I could listen to the song and add it instantly to my slideshow. I also was able to tell if the song was of “low”, “medium” or “high” energy and the exact length. This was important to me because I didn’t want to have to listen to a song all the through just to see if it fit the mood or number of my photos. I was able to choose multiple tracks, delete them and see how long each image will show up on the screen during the slideshow. The “duration of each image” was such a thoughtful piece of information added in Smartslides. It helps me make quick music choices based off of how many photos I have. With many of the other slideshow softwares I have used, I had to figure how long each photo was shown by trial and error. The next section is what Pixellu refers to as “Wrap Up”. Once you get to this section you can’t go back to the “Music” or “Images” section that you were previously in but you can still do those same functions as if you were in those sections. I didn’t understand why that was but I was fine with it when I realized that I could still add/delete/rearrange images as well as add/delete/trim any music track that I had previously chosen. In the “Wrap Up” section you have the ability to create “segments” based off of how many music tracks you chose (i.e. 2 music tracks = 2 segments). Each segment is customizable by clicking on the icons on top of the segment. 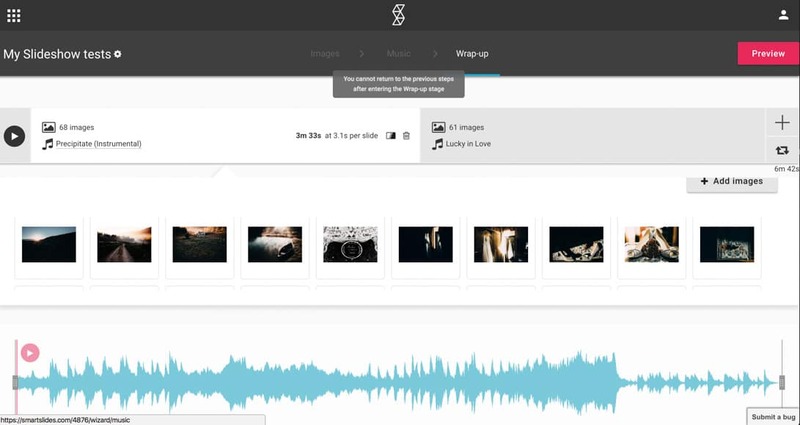 You can rearrange, delete, and move images to other segments and change, add or trim music. You can also easily click the “play” icon or “preview” button to see the slideshow and any changes made. The information that was most important to me was still how many seconds each image showed up. The difference in the “Wrap Up” section was that it showed how many seconds each image showed up in a specific “segment” comparatively to the whole slideshow in the previous screen. I found that helpful when I started moving images out of one segment and into another. The ability to move images to specific segments was valuable in cases where I might want to have a slower, romantic song for getting ready and the ceremony versus having a fast-paced, party song for the reception. I also found the ability to shorten any music track very helpful because many times I didn’t have enough images to display for an entire song. The other option you have in a segment is how each image “transitions”. I can choose from 3 options plus choose how long the transition takes place. If you wanted to create continuity between multiple segments then just click “apply to all segments”. During import, SmartSlides distributes your images throughout each segment and displays them at different lengths for some reason. Luckily, it has a “one click” solution that would “spread images evenly across segments”. This displayed all of my images throughout the whole slideshow for the same duration. The thing to keep in mind here is that if you move images to another segment after pushing this button then your images will not be displayed evenly across segments. Once you’re done editing your slideshow, you can press the red “preview” button. 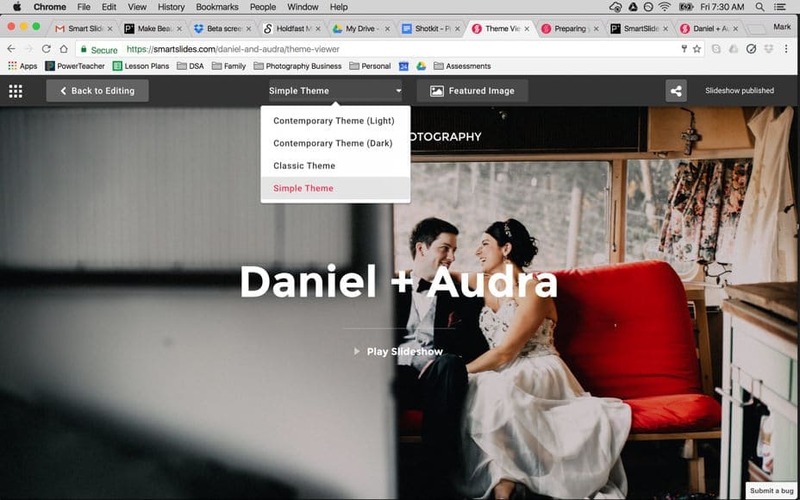 Here you choose one of the four themes to display the slideshow in as well as choose the “featured image” to display before the slideshow is played. Once you’re ready to publish you’ll have two options to share. The first is the direct URL to the slideshow. Pixellu actually creates a stand-alone page for your slideshow that is professional and beautiful. The other option is to embed the video into your own site using the “embed code”. There are two types of pricing plans for SmartSlides. Annual and Monthly. The “monthly” plan is very similar to the Adobe CC plan in that you can pay month-by-month and cancel at anytime. 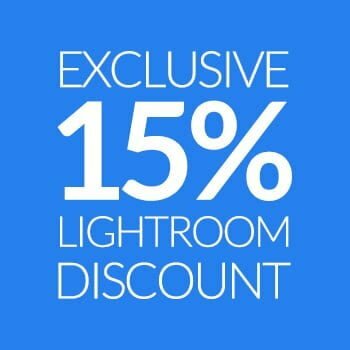 This would be ideal for photographers who may just want to use it temporarily or just don’t have it in their budget to purchase the “annual” plan. Monthly is a bit more expensive than the “annual” plan but for those of us who may only use it for a limited amount of time this may make the most sense because you can purchase it temporarily. The “annual” plan is better value even though in both plans, the payments are made monthly. 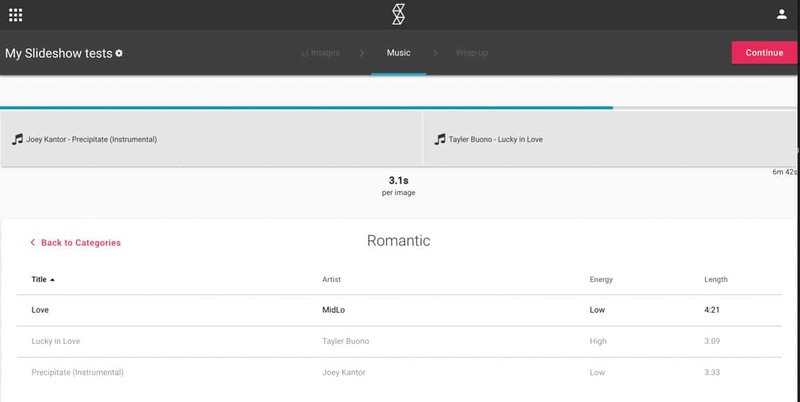 There are 3 different levels that you can purchase with a Smartslides account: Starter, Pro and Studio. 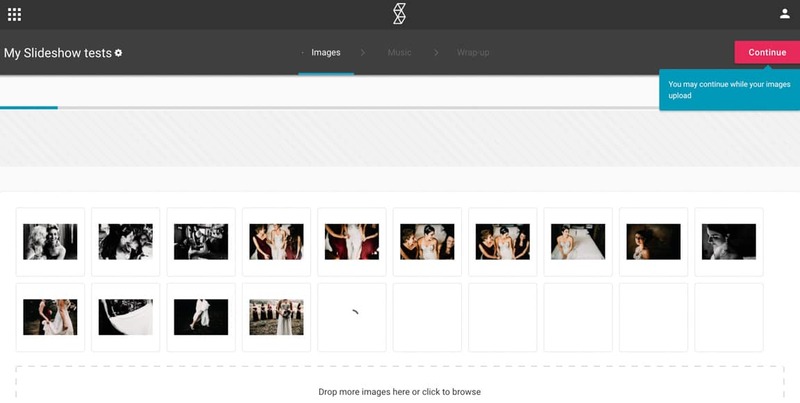 This is simply based off of how many slideshows that you would like stored using SmartSlides‘ web platform. The only thing that I think could be improved here is the “studio” storage. Although 1,000 slideshows is a lot of content to create and it would likely take a while to produce that, I am curious why there is limit on the slideshows that you can create considering it’s the highest plan that you can purchase. Pound-for-pound I think the pricing is reasonable and has been customized with the modern photographer in mind. When you compare the pricing to their competitors, the ease of use, and professionalism, then you’ll see that SmartSlides is packing in a ton of value. There’s also a special 25% discount if you head over to the SmartSlides website today – click here to find out more. One of the highlights of SmartSlides is the well-thought-out customizations that seem to tailor towards the most important elements of a professional photography slideshow. 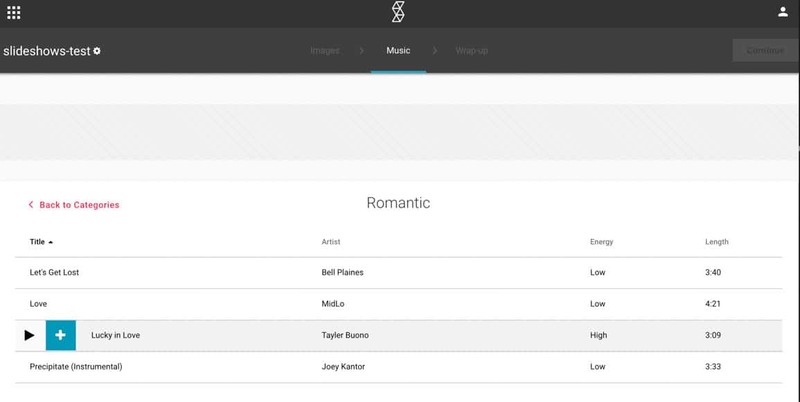 Elements like music, theme, segments, transitions and a custom domain are all notable. Another valuable highlight is the learning curve. 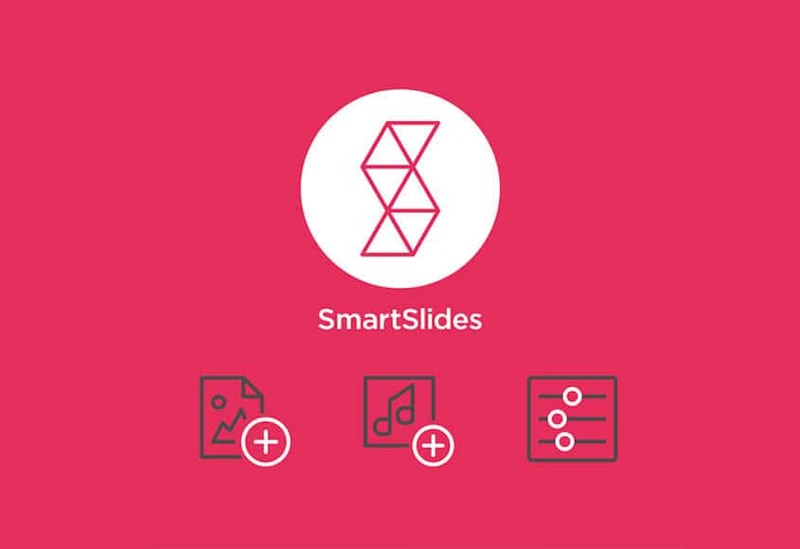 Comparing to other slideshow software, the amount of time it took me become proficient in SmartSlides was was around 50% less. I found the interface intuitive and easy to use because of the minimal, simple design. Because SmartSlides uses HTML5 rather than Flash, the speed during upload, designing and publishing was easy and fast. I was under the impression that because my files were so large that SmartSlides would struggle to quickly change and manipulate the slideshow but I made changes without any lagging or loading. The simple, minimal design of SmartSlides is another highlight that stands out to me although I do think there is room for improvement here. It’s evident that Pixellu put so much time into the features and options. They’re functional and I actually enjoyed designing my slideshow. 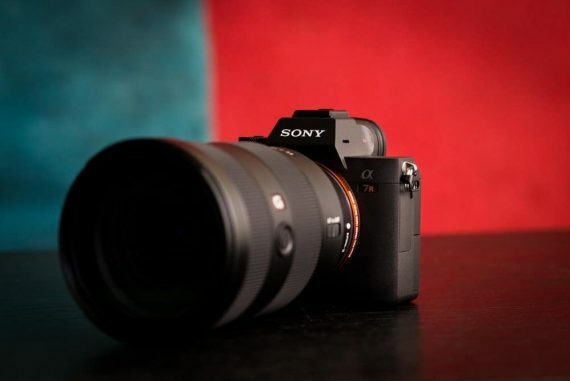 The specific areas that need improvement are with the images after they’re uploaded. When rearranging images to tell a story in a visual order I found it difficult to make changes. I had to “zoom out” in order to see the “rows” of images so I could rearrange the order. I also could only move images up one row at a time which was inconvenient in segments with more than a dozen images. 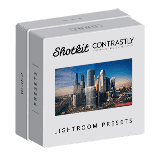 The professionalism alone, stands out from all other slideshow software that I’ve experienced. 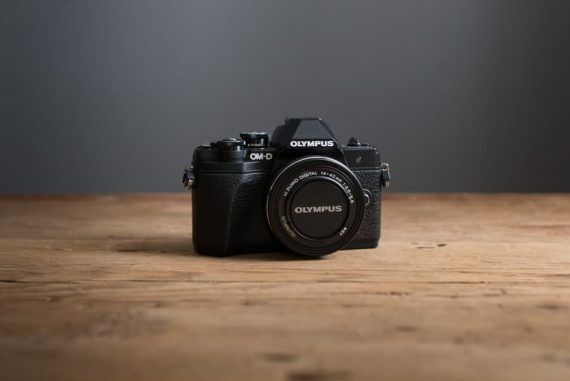 The final product helps my clients focus on the images themselves and allows them to experience the photos without the usual distractions of videos such as ads, pop-ups or promos. The ability to customize a client tailored URL as well as embedding the video into my website was extremely easy, quick and I didn’t have to make any tweaks! Here is an example of the slideshow that I made using SmartSlides as well as the same video embedded in my Squarespace blog. Looks like a great tool for my website. Will have to check this out!